This ministry consists of teens ages 13-18. The purpose of T.W.A.N.A. 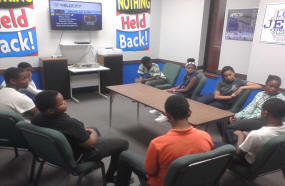 is to give this dynamic group of young believers a firm biblical foundation. Developing the whole person; spirit, soul, and body is vital for this ministry. Our teens are being prepared to live effectively in the now, and also in the future. They receive bold messages that are relevant to their time. They are encouraged to love Jesus with all of their hearts, and never be ashamed to own him before their friends. T.W.A.N.A. sponsors off-the-chain CRUNKFESTS; YOUTH EXPLOSIONS and RETREATS. These events are designed to enhance their Christian growth and promote fellowship with other young Christians. It also gives them a setting in which they can express more freely their praise and talents unto the Lord. T.W.A.N.A. participates in community outreach projects; contributes to crisis situations; goes on “just for fun” outings and assists in church events.